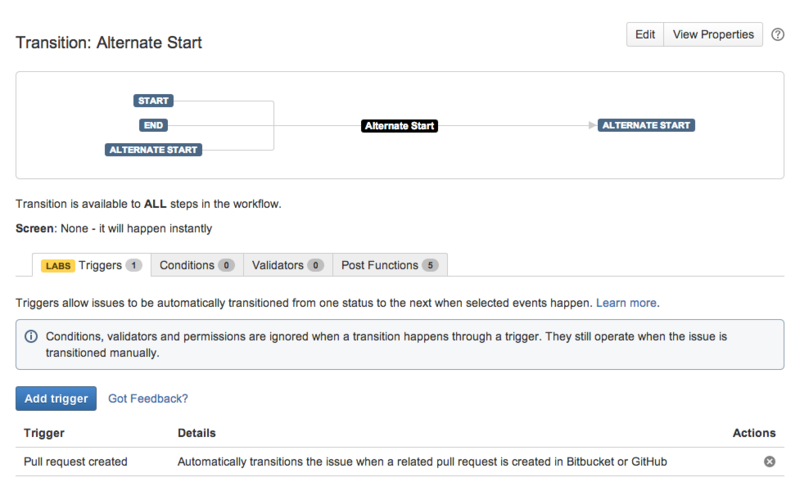 JIRA administrators can configure triggers in JIRA workflows that respond to events in your linked development tools. This allows you to set up your development tools and JIRA workflows so that, for example, when a developer creates a branch to start work on an issue, the issue will automatically be transitioned from 'Open' to 'In progress'. For now, in Labs, this only works with the 'create pull request' event in Bitbucket (and Github), but we'll be adding more events for Bitbucket, and events for Stash, soon. A JIRA admin can configure a trigger on a workflow transition when editing the workflow – see Advanced Workflow Configuration. Repository branches, commits and pull requests are automatically linked to a JIRA issue if the JIRA issue key is included in the commit message, branch name or pull request title – see Streamlining your development with JIRA Cloud. We are starting the rollout of the new OnDemand purchase experience to existing customers. With this update, you will be able to perform most of the purchase and evaluation tasks within your OnDemand site instead of on the My Atlassian site. This rollout will approximately take three weeks to complete. For details about the new experience and what it will look like, see the Easy in-product trials and G rowing with your team sections on OnDemand Purchase Experience FAQ - May 2014 .